Can be charged through your PC, Laptop, power bank or a wall charger. 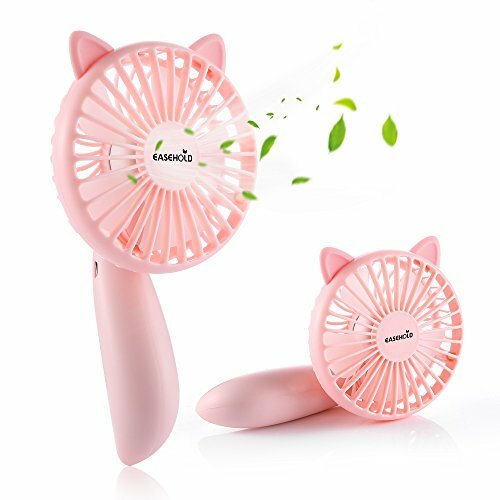 Unique Cat-ear and Fox-tail Design: This creative mini usb fan designed with cat ear and fox-tail handle makes it look very cool. The compact size makes it easily to hold by hand, quite lightweight to take it with you wherever you go. USB Rechargeable: The USB powered fan features a built-in rechargeable 1200mAh Li-ion battery which can be connected with your PC and power bank. The blue indicator light will keep blink until the fan gets fully charged. Adjustable Wind Speed: There are 3 speed levels rating from low, medium to high. You can adjust appropriate fan speed by pressing the power button repeatedly. Your personal customized cooler. 180°Twist and Use as You Like: Except for convenient handheld use, this fan can also be settled stably on flat surfaces like your desktops, bedside table, nightstands and more. Whether you are studying at school, or working in office, you can get cool and comfy wind. Strong Wind &Super Quiet: Soft silicone finish makes it touch smooth when you hold it by hand. And the quality motor built in ensures strong wind and quiet operation at the same time. If you have any questions about this product by Easehold, contact us by completing and submitting the form below. If you are looking for a specif part number, please include it with your message.